First identified in the late 1990s (Mantua 1997), the PDO is the most significant year-round pattern in monthly SSTs across the North Pacific. Similar to ENSO, the PDO has two states – warm and cold – and involves various other aspects of the climate system. Unlike ENSO, the PDO isn’t one climate phenomenon. What we call the PDO is instead an aggregation of mostly independent processes. If ENSO is an ice cream flavor, the PDO is climate Neapolitan -- a combo of different individual processes which influence a broader area. Sea surface temperature (SST) anomaly pattern associated with the positive (or warm) phase of the Pacific Decadal Oscillation (PDO). Red shading indicates where SSTs are above average, and blue shading shows where SSTs are below average. During negative (cold) phases, the pattern reverses. Image adapted by NOAA Climate.gov from original by Matt Newman based on NOAA ERSSTv4 data. What does the PDO look like? The warm phase of the PDO consists of a boomerang of warmer-than-average seas along the coast of western North America with a pocket of colder-than-average waters in the central North Pacific. The cool phase is the opposite. If we compute an index to attempt to quantify the strength of the PDO we would find that there are distinct periods of time, “regimes,” where the PDO is more consistently negative or positive. 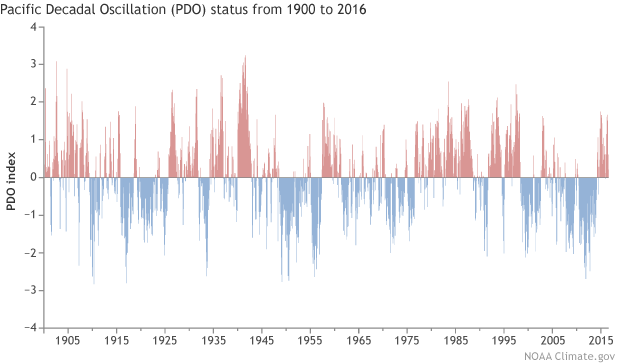 Pacific Decadal Oscillation (PDO) index values from 1900 to 2016. The PDO temperature pattern seems to follow multi-year regimes, in which the index is mostly positive (warm) or negative (cool). Image by NOAA Climate.gov, based on original provided by Matt Newman. What makes up the PDO Neapolitan sundae? To keep this simple (and for the analogy to still work), it’s easiest to think of three things that make up the PDO. The first—our chocolate—involves the strength of a semi-permanent area of low atmospheric pressure off the Aleutian Islands, creatively called the Aleutian Low. In the Northern Hemisphere, air circling a low spins counterclockwise: from the north on the western side of the low, and from south on the eastern side. The stronger the low, the stronger the winds. If the Aleutian low is stronger-than-average, unusually strong southerly winds on the eastern side of the low run along the west coast of North America, warming the coastal waters by reducing the amount of cold water that normally comes up from depth. On the western side of a strong Aleutian low, the northerly winds and the stormy conditions help to rile up the water increasing the amount of cold water at the surface, and leading to below-normal sea surface temperature anomalies. The opposite is true for a weaker-than-average or non-existent Aleutian low. So what makes the strength of the low vary? A couple major things: 1) Random weather that we simply cannot predict months or years in advance. 2) ENSO! El Niño, for instance, generally leads to a stronger-than-average Aleutian low during winter when the low is usually already at its strongest. La Niña leads to a weaker Aleutian low. Thus, one major influence on the PDO is the state of ENSO! The vanilla in the PDO’s climate Neapolitan is the ocean itself. SST anomalies that develop due to random weather or an El Niño/La Niña normally wind up reaching below the sea surface. These deeper anomalies can get stuck at depth—cut off from weather patterns and currents at the surface that cause anomalies to dissipate—only to “re-emerge” the following year. The getting stuck happens in the summer (1). Sort of like how your favorite long sleeve shirt might make its way to the bottom of the drawer and be forgotten during the warm summer months only to re-emerge the following winter. This phenomenon is called “reemergence,” and it helps to continue trends in the PDO from year to year (Alexander and Deser 1995). Lastly, our final flavor—the strawberry in this Neapolitan—is the Gulf Stream of the North Pacific Ocean, the Kuroshio Current. Changes along the ocean current in terms of strength and location, which occur over decadal time periods, can also impact SSTs in the western half of the North Pacific (2). Put all three of those impacts on the ocean together and you get most of the PDO. So what does the PDO actually do then? If you noticed, the three items mentioned above don’t necessarily act together or really have anything to do with each other. That’s because the PDO is not a well-oiled machine like ENSO; it’s the ocean surface temperature’s aggregated response to all sorts of atmospheric and oceanic processes. For the most part, the atmosphere is what changes the temperature pattern across the North Pacific Ocean, not the other way around. The PDO is therefore a response, not an agent of change itself. But what about those regimes—time periods of consistently positive or negative PDOs? If the processes aren’t really connected, how do those periods arise? Well, it could be a natural result of the efforts to try and capture all of the influences in the variability of the Aleutian Low, which manifests itself in ocean temperatures in the North Pacific, via one index, the PDO. Each “regime” of the PDO could be due to a random assortment of processes ranging from ENSO to ocean reemergence to random weather. In fact, it is known that ENSO can have periods where El Niños occur more often than La Niñas (Wittenberg et al., 2014). Since ENSO has such an influence on the PDO, these PDO regimes could be reflecting ENSO regimes. Can the state of the PDO predict anything about the atmosphere though? Since the PDO largely represents an ocean response to the atmosphere, you have to be careful in saying that the PDO actually causes any big change in the atmospheric circulation. It can have an influence locally, though. If you live adjacent to the west coast, a positive PDO can lead to local impacts to weather and climate through the direct effects of warmer-than-average ocean waters. Correlation between precipitation anomalies and the Pacific Decadal Oscillation (left panel) and the El Niño-Southern Oscillation (right panel) during November-March from 1901-2014. 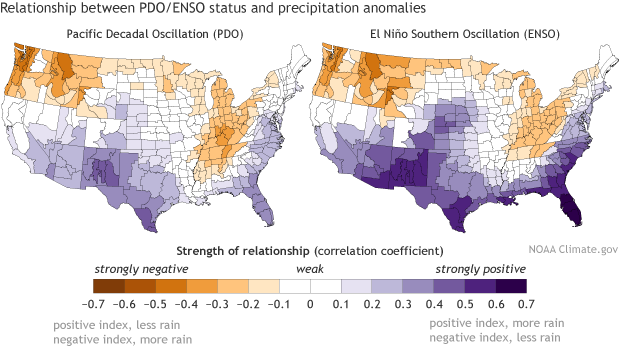 The PDO has little additional influence on precipitation beyond what ENSO already explains. Image adapted by NOAA Climate.gov from original provided by Matt Newman based on NCEI Climate Division data. However, rainfall over western North America, as seen in the images above, is better explained by ENSO than the PDO since there is a more direct physical connection (3). A major reason the PDO and ENSO impacts look similar is because ENSO is one of the three major flavors that make up the PDO Neapolitan itself! Overall, the PDO index is a good way of getting a sense of how a bunch of different ocean and atmospheric processes are affecting the North Pacific Ocean. But it is important to remember, that it is the mixture of those processes that can impact weather and climate across the United States for instance, not the PDO itself. Special thanks to Nate Mantua (NOAA/SFSC) for reviewing this post and to Matt Newman (NOAA/CIRES) for providing figures based on Newman et al. (2016). (1) In the North Pacific, SST anomalies can develop to a greater depth in the ocean during winter than in summer because the Aleutian Low is strongest in winter, helping to mix the water to a deeper depth (a deep mixed layer). 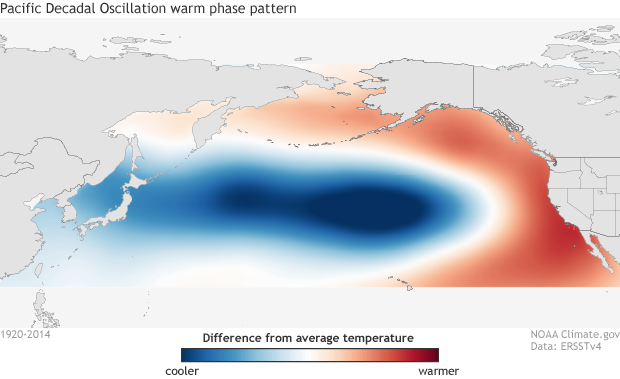 When the calendar shifts into spring and summer, the Aleutian Low weakens and moves north to be replaced by a high-pressure system, calmer weather and a shallower area of mixed water. It can be like installing a barrier in the ocean. Any water temperature anomalies underneath that wall get stuck, having to wait to dissipate until the following winter when the mixed layer deepens and that barrier doesn’t exist. (2) The decadal changes in the Kuroshio current system are actually forced by winds in the North Pacific, associated with the Aleutian low, setting off slow moving, westward propagating oceanic Rossby waves in the upper ocean. These waves take three to ten years to cross the basin and show up as sea surface temperature anomalies in the western North Pacific. (3) We’ve previously explained how sea surface temperature anomalies related to ENSO affect the Hadley circulation through increases in thunderstorm activity across the central/eastern equatorial Pacific Ocean. This can in turn impact weather and climate across the mid-latitudes. This does not hold true for the PDO. Sea surface temperature anomalies in the North Pacific do not affect thunderstorm activity since the water is too cold to begin with and the dynamics of the mid-to-high latitude atmospheric circulation is different from the tropical atmospheric circulation. This is why I say that the PDO has mainly local climate effects. Mantua, N.J., S. R. Hare, Y. Zhang, J. M. Wallace, and R. C. Francis, 1997: A Pacific Interdecadal Climate Oscillation with Impacts on Salmon Production. Bull. Amer. Meteor. Soc., 78, 1069-1079. Kumar, A., H. Wang, W. Wang, Y. Xue, and Z.-Z. Hu, 2013: Does knowing the oceanic PDO phase help predict the atmospheric anomalies in subsequent months? J. Climate, 26, 1268-1285. Wittenberg, A.T., A. Rosati, T.L. Delworth, G.A. Vecchi, and F. Zeng, 2014: ENSO Modulation: Is it Decadally Predictable? J. Climate, 27, 2667-2681. Perhaps you failed to say, that now we are in a cold phase PDO, and that will probably last till 2025-2030, we have the warm phase 1978-1999/2000, and before that, its cold phase during 1947-1977 approximately. During cold phase El Niño is less frequent and intense than during warm PDO. Also as I have said before, this index is not generally taken into account in modelling El Niño. It seems that El Niño in 1-2 does not develop much during cold phases (2015-2016). Check out California impacts of El Niño during cold phase PDO. It's hard to tell what phase we're in without at least 2 or even 3 years shown to be in that phase, since there are occasional blips (short-lived reversals). It now appears that in 2014 we did change to the warm phase after having been in a cool phase since about 1999. About the duration, your sense is correct that it is not a set number of years, and can vary noticeably, as can be seen in the second figure above. It is generally assumed that the PDO has been negative (cold) since about 1995-2000 thru 2013. However, what about the last 3 years? The PDO has been consistently positive since January 2014. How does one discern if this is short term noise in the midst of a still negative PDO, or, has the PDO now flipped to positive? If the latter, it would make the southeast US drought difficult to explain, correct? The PDO has stayed positive since early 2014, as you say. See the site: research.jisao.washington.edu/pdo/PDO.latest. We don't yet have solid attribution for the persistence of drought in the Southeast. Does the PDO tend to have an effect on precipitation in Japan, in the same way that the AMO does in NW Europe? Can you speak to the claim that the Pacific Ocean sequesters enough heat energy to significantly influence global temperatures, and that the degree to which heat energy is sequestered is related to the phase of the DPO? How much can we attribute rising global temperatures to this phenomenon? Appreciate your expertise. Maybe I just answered my own question. If you take data for global temperature anomaly from NASA's webpage (https://climate.nasa.gov/vital-signs/global-temperature/), and compare it to the PDO graph on the NOAA webpage (https://www.ncdc.noaa.gov/teleconnections/pdo/), I see that 2 of the time frames of highest temperature increase (ie. 1933-1944 positive PDO phase, and 1994-present negative PDO phase), show that global temperature change and PDO phases are not correlated. Would you conclude that PDO phase does not correlate with global temperature trends? Any research that concludes this more effectively than my instant analysis here? Since the PDO is a cycle of warm and cool phases, its contribution to any longer term trends is minimal. However, the phase of the PDO could impact shorter-term trends depending on the phases, even while not impacting the longer term warming trend globally. The JIASO PDO index has not had negative number since December 2013. That's 49 straight months, an apparent JIASO record for staying in positive territory, and during which the Berkley Earth mean has been a rather astonishing .70 ℃ (the mean from 1999 to 2014 is .46 ℃.) How can it make any sense at all to keep referring to the PDO as being in a negative phase that started around 1999? It's pretty obvious the negative phase that started around 1999 has ended. Time to put up its tombstone and to move on. Lately I have seen references to PDO neutral. Is there such a thing as PDO neutral? Hi-- I asked Nate Mantua (now with NOAA) about this index and he confirmed to me that global warming signal is likely impacting this version of the PDO index. The influence is not large, but it is probably enough to transform some of those small, positive PDO values in recent years into negative PDO values. "Neutral" is a designation of "near average." For ENSO, we designate -0.5 to +0.5 (Nino-3.4 index) as Neutral, but these thresholds are somewhat arbitrary. The same can be done for the PDO index, but I'm not aware of any effort to define thresholds for this index. Yes, that seems reasonable. I recently read a new paper on the PDO by Wills out of Caltech which calls 2013/2014 a PDO shift.